The VW Touran is described as a so-called midi-MPV. She appeared on the market in the year 2003 and immediately managed to conquer a lot of hearts. During this period, Volkswagen found that there was a certain amount of space between the smaller models of the brand and, in particular, the VW Sharan. This hole had to be filled and the VW Touran is of course more than enough to fill it. The VW Touran became the successful response of the German Volkswagen to competitors such as the Renault Scénic and the Opel Zafira. Have you also chosen to buy a VW Touran, but do you now have to deal with glass damage to the windscreen? Discover our economical solution for the damaged windscreen replacement of your VW Touran! The name VW Touran is actually a fusion of two words. This concerns 'Touring' on the one hand and 'Sedan' on the other. Unfortunately, for Volkswagen, this name had already been registered as a trade mark. This meant that the German car brand had to take over the name of a German-Turkish family. The amount involved in this acquisition has never been officially announced. The VW Touran is produced together with the VW Tiguan in Wolfsburg, Germany. Why is a damaged windscreen so dangerous? Are you obliged to repair the glass damage in question? May the damage have a certain effect on the safety of the occupants. How can the damage be repaired most efficiently? Let us answer the first question immediately. 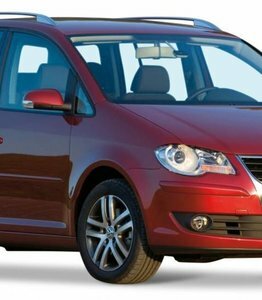 A windscreen replacement of the VW Touran is only mandatory when the damage is a nuisance for the driver. In other words, is there a crack in your field of view, for example? In this case, it must be repaired immediately. Replacing your windscreen is the only way to avoid disapproval of the car inspection. The appearance of your VW Touran is considerably reduced. The stiffness of the chassis can be compromised, 40% of which is achieved by the automotive glass. It may not always be necessary to replace the VW Touran windscreen, but it is still recommended. Moreover, you certainly do not necessarily have to take high costs into account. Choosing to buy an after market car window ensures that you can enjoy excellent quality at a very modest cost. Replacing an inexpensive windscreen in case of damage is therefore possible in a very simple way. The success of the VW Touran meant that Volkswagen did not want to depreciate the model after a certain period of time. Nevertheless, a number of changes had to be made. This could best be done by adding a facelift to the existing model. This was done in the year 2006. The new VW Touran was also equipped with ParkAssist. This innovative option ensured that the not-so-small VW Touran was immediately made accessible to an even larger target group. Of course, you cannot replace a VW Touran windscreen without ordering a new one. However, do you ask yourself the question: 'What does a car window cost'? In principle, you do not necessarily have to fear high costs. Many people think the opposite because they are looking in the direction of an original windscreen. However, such a car window carries a brand logo, which means that it can and may initially only be sold by an authorised brand dealer. However, there are also alternatives. By choosing one of our after market windscreens you choose for a car window that is equally qualitative, but much cheaper. The windscreen replacement of your VW Touran with after market automotive glass is definitely worth the effort. The cost of the windscreen replacement of your VW Touran is not only determined by the amount that has to be paid to buy the new windscreen. What about the costs of installation? For this purpose, you can make excellent use of the services of one of our certified partners. These experts are perfectly suited to replace the windscreen of your VW Touran and can also do this on location. Are you also insured for glass damage? In that case you can also have your deductible cancelled up to an amount of 150 euros! This way you can reduce the price of a new VW Touran windscreen without compromising on quality.